As the latest seasons of The X Factor continue in both Australia and the UK, a new batch of contestants prepare for what seems to be an increasingly short stint on the charts. And if anyone knows how quickly you can go from being a top 10 performer to an artist that struggles to hit the top 50, it's current Australian and former UK judge Dannii Minogue. This week in 1990, the former Young Talent Time star reached the ARIA singles chart with her second single - and was already finding the going tough. She wasn't the only act we'll see this week that struggled to live up to prior chart glories. Reigning supreme for a second week at the top of the chart was a singer who was having no trouble going from lead singer to solo star. At number 1 again this week in 1990 was "Blaze Of Glory" by Jon Bon Jovi. Spurred on by the warm reception the 1989 remix of "Send Me An Angel" received, Australian synthpop band Real Life channelled The Beloved for this first new single in four years. They would long outlive Madchester, but with this track, British indie group The Charlatans released one of the scene's best singles - and scored their first UK top 10 hit in the process. The second girl group song called "Hold On" in three months, this debut single - and US number 2 hit - from the R&B vocal harmony group didn't win Australia over, but En Vogue's time would come. One of three singles spruiked by BMG this week, "Why Fight It" was the return of '80s hitmakers Mondo Rock, who were newly signed to the label. The first new music from the band in three years - and from singer Ross Wilson since his solo album, Dark Side Of The Man, the year earlier - it was the lead single from the upcoming album of the same name. Unfortunately for Mondo Rock, which at this stage consisted of Ross, long-time guitarist Eric McCusker and some ring-ins, it seemed the Australian public had moved on and interest in the band's return was limited. Former Goanna singer Shane Howard was also finding few takers for his solo material, with "If The Well Runs Dry" performing even worse than previous single "Walk On Fire". 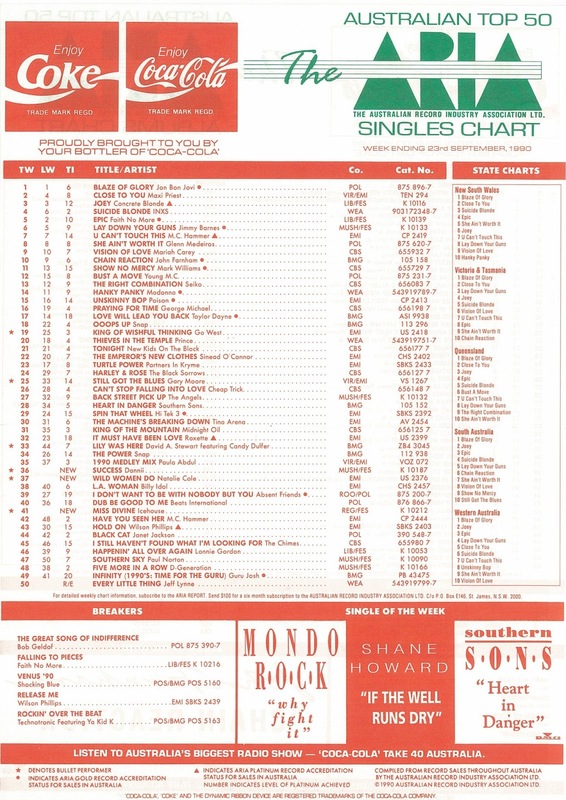 At least BMG also had Southern Sons' "Heart In Danger" - the third Single Of The Week, which moved into the top 30 this week - on their hands to make a decent show of things. Poor Ya Kid K. Just when the rapper finally received a featuring credit on a Technotronic single, it went and flopped in Australia - and that was despite the excellent remix by Bernard Sumner from New Order being the main version on the single locally. Having found "This Beat Is Technotronic" a bit underwhelming - and as its ARIA chart peak suggested, I wasn't alone - I was disappointed this return-to-form follow-up didn't get a better reception. I don't know what Icehouse had been thinking with "Jimmy Dean" and "Big Fun", but the band fronted by Iva Davies finally got it right with this second single from Code Blue, which returned them to the top 20 for the first time since "Touch The Fire". Debuting just eight weeks after "Big Fun" (and one week after that single's inglorious fall out of the top 100), "Miss Divine" still wasn't anywhere near approaching Icehouse's best single - it's about as good as a "Nothing Too Serious" or "Street Cafe" - but it was such a relief they released a non-dreadful single, that hardly mattered at this point. It would turn out to be a short-lived respite from the doldrums for Icehouse, who never returned to the top 40 hereafter. While Icehouse singles were flying in and out of the chart, Natalie Cole's "Wild Women Do" had been a top 100 fixture since mid-May and finally burst into the top 50 this week, no doubt boosted by the runaway success of Pretty Woman, and its two soundtrack hits from Roxette and Go West. Of course, the film soundtrack had been on the albums chart just as long and already enjoyed four weeks at number 1 - so it's little surprise Natalie's single only spent three weeks in the top 50 and didn't get any higher than number 37, but at least she got there in the end. Things had got off to a flying start for Dannii Minogue as she embarked on her pop career, with debut single "Love And Kisses" peaking at number 4 just months before sister Kylie reached the same position with her latest single, "Better The Devil You Know". But Dannii was really tempting fate by calling her second single "Success" - or "$ucce$$", to give the song its stylised title. Like "Love And Kisses", "Success" was produced by Alvin Moody and Vincent Bell, but this time around Dannii achieved something with her second single that Kylie wouldn't until her 15th - a songwriting credit. The truth of the matter was "Success" wasn't as good a song as "Love And Kisses", which I hadn't like that much to begin with - and the single struggled on the chart, peaking just inside the top 30. Like her debut effort, "Success" was eventually released in 1991 in the UK - this time with a new video and a much-needed remix by Bruce Forest - and fared much better there, peaking at number 11. In Australia, things were going to get even worse for Dannii before they got better. Next week: an Absent Friend goes solo, John Farnham reverts to formula and one of this country's all-time biggest bands charge onto the chart. Plus, the follow-ups to two big chart hits from an American band and female singer. 'God Tonight' entered the AMR top 50 printed in Smash Hits at #47, so assumed it must have charted not too far outside of the ARIA top 50. I was quite surprised when I learnt it only peaked at #83. En Vogue were probably too American r&b sounding to score a hit here in 1990. They deserved more local success than they had with their pre-'Don't Let Go (Love)' singles. I don't recall hearing 'Why Fight It' or 'If the Well Runs Dry' before. 'Rockin' Over the Beat' may have performed better if it had a proper video. I hadn't seen the video until it debuted in the top 60 on rage, and don't think I saw it on any other shows. Ya Kid K's relationship with the 'group' must have soured by this point to (presumably) refuse to appear in the video. 'Miss Divine' is one of my favourite Icehouse singles. I think they suffered the same 'everything we do now is going to be compared to our (by far) biggest album' fate as INXS. The 3 year gap between (proper) albums also didn’t help. Iva's earrings in the video are awful! There was a dance remix (featuring a rap) of 'Wild Women Do', complete with remix video that rage aired when it finally broke into the top 60. That may have helped propel the single up into the top 50 finally. 'Success' was really quite poor, and suprisingly even worse IMO in its UK remix form. Dannii trying to be Janet was never going to work.